Even with a whole host of new technologies out there, for communicating with people at a distance, email remains my lifeline. For work email, I use MS Outlook, as I have for years. I always wished it would work how I wanted it to work. TechHit’s SimplyFile gets me closer. I can file an email message in its appropriate folder with a click of a button (or keyboard shortcut). I can create a task from an email message. I can turn an email message into an appointment in my calendar. I can make a message disappear from my inbox for a designated period of time, and then have it reappear on its own later. SimplyFile is an Outlook addin. (Try it free for 30 days. After that, it’s $39.95.) I tried it for 30 days, but I wasn’t sure it was worth the price. I uninstalled it. After not having it for an hour, I pulled out my credit card. It made my email time so much more efficient, I couldn’t go back to my pre-SimplyFile way of doing things. The software is so easy to use, there’s really nothing to learn. Truly. The toolbar. There are two ways to access the SimplyFile toolbar. If I’m viewing messages in the main Outlook window, I can use the bottom-most toolbar in this image. Filing messages. When I have a message selected in Outlook, SimplyFile takes a guess at which folder I’d like to move it based on where I’ve put similar messages in the past. If I want to put the selected message in the ‘OTRP’ folder, all I need to do is click ‘File Message’ or use the keyboard shortcut Alt+M. If that isn’t the right folder, clicking the drop down arrow in the folder box gives you SimplyFile’s next best guesses. The first ones are SimplyFile’s top 5 guesses. The next 20 are good choices. If I don’t like any of those options, I click ‘<Select/Create folder>’ to select/create a new folder. This list shows all main folders and their subfolders listed together. If you’d like to see the folder paths, you can change that setting in SimplyFile’s options menu. Task it. When I get an email that requires some action on my part, I ‘task it.’ This not only calls up Outlook tasks, but it embeds the message in the task. For example, let’s say I open the following message. All I need to do is click ‘Task It,’ and SimplyFile opens a new Outlook task. The subject line from the original email is the subject line for the task. Change it if you’d like. The body of the email is reproduced in the body of the task. Also feel free to edit this space at will. Double clicking the envelope at the bottom of the body will open the original email message. Schedule it. Open an email. Click ‘Schedule It.’ Outlook opens a new Outlook appointment. Like a task, the email’s subject line becomes the appointment’s subject line. 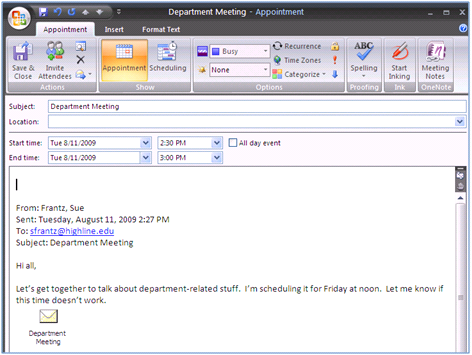 The email’s body is copied into the appointment’s body. Double-clicking the envelope at the bottom opens the original email. You will need to change the date and time. SimplyFile isn’t smart enough (yet?) to pull the date and time out of the body of the message. If moving your mouse to click ‘Schedule It’ isn’t fast enough for you, in SimplyFile’s options, you can create a hotkey that will allow you to turn an email into an appointment without your fingers leaving your keyboard. Snooze it. Have a message in your inbox that you don’t need to deal with right now? But you want to get it out of your way? Hit the snooze button. For any message, when you click ‘Snooze It’ this dialog box appears. The default is 7 days, but change the days/hours/minutes to whenever you’d like. The message will disappear, then like magic it will reappear in your inbox at the time you designated. 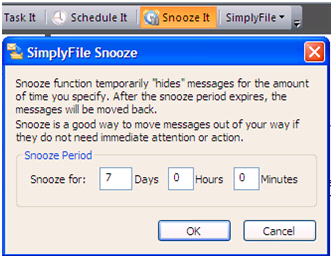 To do this, SimplyFile creates a ‘SimplyFile’ folder in your inbox with a ‘Snooze’ subfolder where it holds your snoozed email messages until the time expires. If you’d like to see what’s snoozing, just open that folder. If you’d like to de-snooze a message, just drag it back into your main inbox folder. Download SimplyFile and try it out for 30 days for free. If you uninstall it and go back to your current way of handling email, let me know how you managed it!